Will Syria see peace in 2018? 6 partages la publication de Flores Magon. Les condamnations de l’offensive lancée par l’armée turque contre l’enclave kurde syrienne d’Afrin sont unanimes et les alliés occidentaux de la Turquie, à commencer par les Etats-Unis, appellent Ankara « à faire preuve de retenue ». « Il ne s’agit pas de mettre la Turquie en accusation et nous comprenons son besoin d’assurer la sécurité de sa frontière, mais une telle offensive ajoute encore un peu plus au chaos au nord de la Syrie », explique-t-on à Paris, en insistant sur la nécessité « de replacer l’ONU au centre du jeu alors que les Russes veulent la mettre de côté ou à tout le moins au second plan. » Les négociations de Genève sous l’égide des Nations unies entre le régime et l’opposition sont au point mort. The war in Syria has all but subsided after seven years of conflict. The fighting and bloodshed that once spanned the entirety of the Arab nation have been relegated to a few areas, raising the question of whether the country will see at least some semblance of stability in 2018.With the help of Russia and Iran, forces loyal to Syrian President Bashar al-Assad transformed the fight against armed opposition groups aiming to overthrow the regime into a « war against terrorism ». 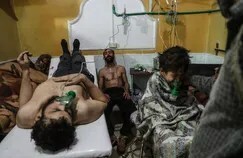 A relentless Russian bombing campaign, and the deployment of tens of thousands of Iranian-backed troops to aid Assad’s men, slowly suffocated the armed opposition and dealt them one blow after another. The rise of al-Qaeda linked groups and the Islamic State of Iraq and the Levant (ISIL) allowed the Syrian government to turn the narrative of a revolution against the government into a battle against « extremist » groups.But while violence has significantly decreased and is expected to continue to do so in 2018, political analysts say the country is unlikely to see a meaningful, political solution to the conflict any time soon. The lack of a political solution, they say, will mean that violence will continue. 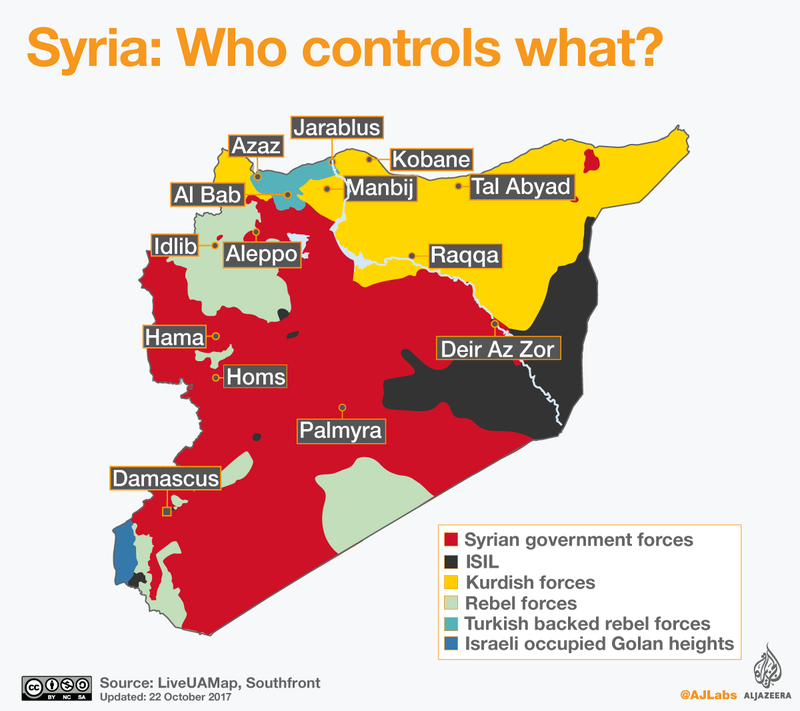 « The Syrian government seems to be winning, in a slow, painful, imperfect sort of way. Large areas of the country will remain beyond the control of Damascus for a long time still, and violence could ebb and flow for years, » Aron Lund, a fellow with The Century Foundation think-tank, told Al Jazeera. « The various peace processes may succeed in tuning down the violence in various ways, but a genuine political transition seems off the table. It probably always was, » he said. Where is fighting taking place and why? In May 2017, Russia, Iran, and Turkey – which supports the armed opposition – agreed to implement a plan for « de-escalation zones« . The plan was aimed at halting fighting and offering safety to civilians in those areas. 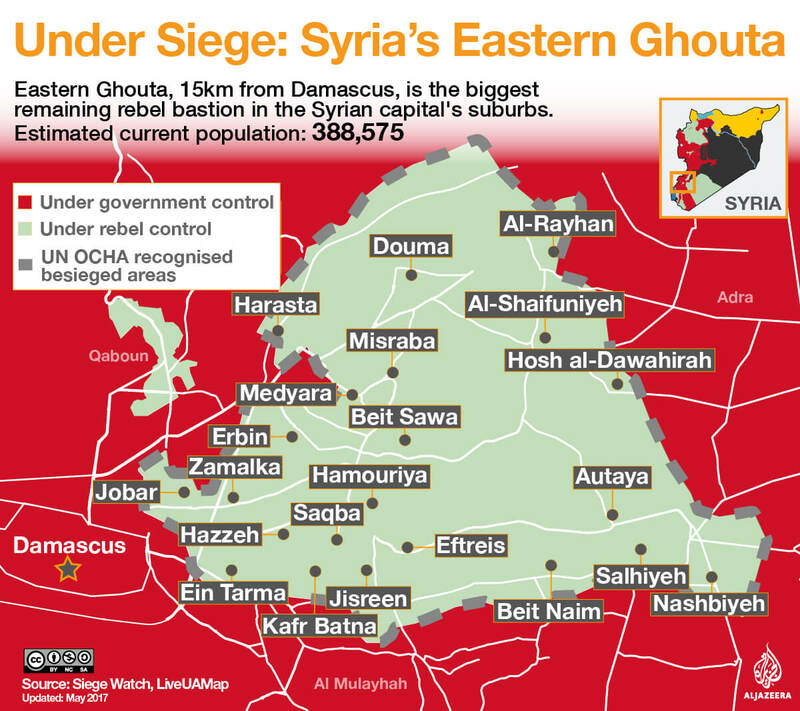 The areas consist of Idlib province, East Ghouta, northern Homs province and the country’s south. But the Syrian government and its allies have not abided by the agreement and continue to target all areas included in the deal apart from the south. For the Syrian government, the proximity of Eastern Ghouta to the capital Damascus makes it a key target. The area is under the control of groups loyal to the Free Syrian Army (FSA), a loose conglomeration of armed brigades made up of Syrian army defectors and ordinary civilians, which receive financial and logistical support from the United States, Turkey, and several Gulf countries. Since 2013, the government has maintained a suffocating siege on the area in an effort to weaken the rebel groups and continues to shell it despite the so-called de-escalation agreement. In Idlib province, however, a former al-Qaeda affiliated group, known as Hay’et Tahrir al-Sham (HTS), dominates. While HTS is centred mainly in the city, some 40 armed groups affiliated with the FSA also have control in other areas of the province, according to Omar Kouch, a Syrian political analyst based in Turkey. Kouch estimates that HTS men number around 10,000, while FSA-linked fighters amount to some 30,000.
Who are Syria’s opposition alliances? « The pretext that the Syrian government is using to attack Idlib is that there is HTS. But Idlib is very important to the regime and to Russia because Turkey also wants to deploy its forces there based on the de-escalation agreement, » Kouch told Al Jazeera from Istanbul. « Thus, the agreement is not being respected – shelling on Idlib did not stop for a single day, » he said. 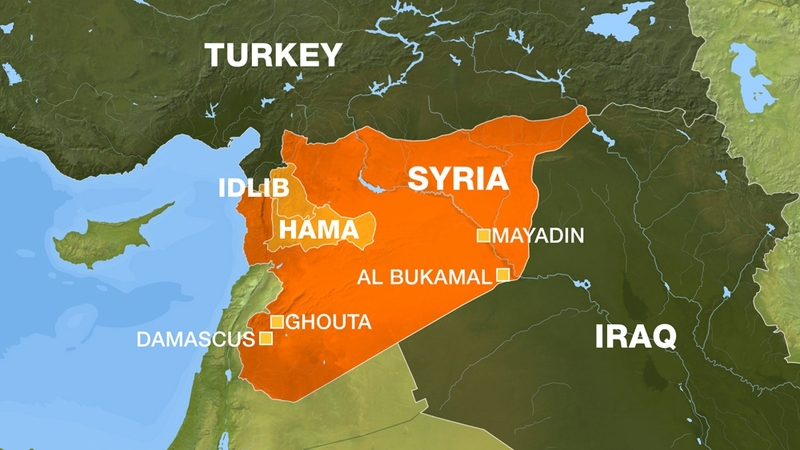 The Idlib-Hama region is strategically important for the government and Russia as it is near to the coastal region where the Russian-operated Syrian Khmeimim airbase sits. The third area witnessing bouts of violence is Syria’s far-eastern region along the Euphrates – between al-Mayadin and al-Bukamal – where ISIL remains potent and continues to launch attacks, challenging Assad’s forces and US-backed Kurdish forces, which have control over much of Syria’s north and east. Is a political solution imminent? On the international level, there are two main tracks of diplomacy centred around finding a peaceful political solution to the conflict. The first is the UN-sponsored talks in Geneva, Switzerland, which began in 2012 and are ongoing. The main aim of the track has been to achieve a political transition in Syria, but it has consistently failed to achieve that goal. The main obstacle has been the fate of Assad: while the Syrian government has consistently refused to entertain any prospect of Assad stepping down, the armed opposition has made clear its position that Assad’s removal is the only option for peace. Russia’s military intervention in 2015 changed the balance of power on the ground and placed Assad’s forces firmly in control. It then largely took over the diplomatic process after its air force helped the Syrian government and allied Iran-backed fighters retake eastern Aleppo from the armed opposition in December 2016. In 2017, the Kremlin decided to launch another diplomatic track – in Astana, Kazakhstan – with the sponsorship of Turkey and Iran. The Astana track brought fighters from armed groups to the negotiating table for the first time and said it aimed to achieve a military ceasefire, address the issue of detainees in government prisons, and facilitate humanitarian aid to civilians. But the main development to come out of the Astana talks has been agreement on the so-called de-escalation zones that have largely been unsuccessful. Most recently, Russia opened a new track for talks at the Black Sea resort of Sochi, which it called the « Syrian national dialogue congress », set to take place in late January. « The Russians want to frame the conflict in Syria as a civil war. That’s why they gave (the Sochi talks) that name. They’re trying to enforce the idea that the talks will reconcile between sects that are at war in Syria and that all that is needed are a few changes in the constitution and elections, which Assad will be able to run for, » said Kouch. « The conflict in Syria is a conflict over political transition, but the Russians are trying to change the narrative. That’s why Geneva was sidelined and Sochi will now be the new political track, » he added. 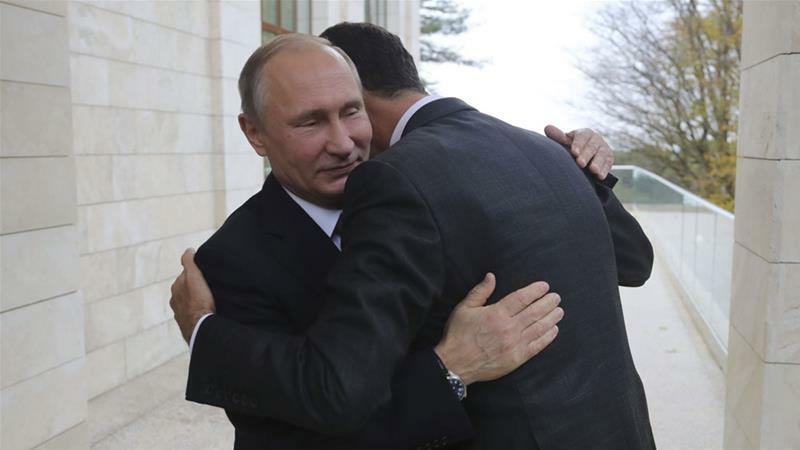 Kouch believes the meeting in Sochi will be « as though Syrians have moved past the phase of war and must now enter the phase of peace and reconstruction ». While Russia and the Syrian governments may succeed in enforcing a military solution and significantly decrease levels of violence, the opposition says that any plan that excludes a political transition will inevitably fail and will hinder Assad’s ability to regain full control over the country. Mohammad Sabra, the former chief negotiator for the largest Syrian opposition bloc, the High Negotiations Committee (HNC), says that while he expects there will be less bloodshed in 2018, the « revolution will manifest itself in different forms if Assad is not removed from his position ». « The rise of the armed opposition came one and a half years after the revolution began. It’s not about the armed groups – it’s about the demands of the Syrian people, » he told Al Jazeera from the United Arab Emirates. 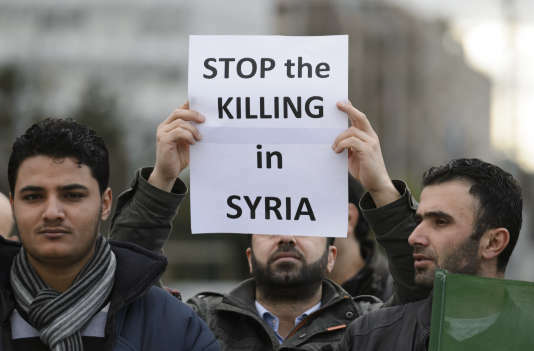 Saving Syria: Is international law the answer? The armed opposition continues to receive logistical support and funding from the United States, Turkey and several Gulf countries, albeit at lower levels. James Gelvin, a professor of the Middle East at the University of California, Los Angeles (UCLA), believes that aid for opposition groups will continue to decline, but will not end, meaning the rebels will be able to continue fighting for some time to come. « Most of the territorial gains the government has made during the past two years have been accomplished by the Lebanese group Hezbollah, Iranian units, Iranian-trained and controlled militias, and private militias, not by government forces per se, » Gelvin told Al Jazeera, explaining that the Syrian government forces are worn out. SOURCE: AL JAZEERA Will Syria see peace in 2018? Bien qu’en perte de vitesse, le mouvement fondamentaliste qui tente d’empêcher que la théorie de l’évolution soit enseignée à l’école est toujours puissant. Un combat centenaire pour la science se poursuit. Dans cette ville, l’ombre des absents – morts ou disparus – est partout. Des hommes, pour la plupart, qui laissent au pays un nombre incalculable de veuves et d’orphelins. Même l’ONU a renoncé, depuis 2014, à tenir son propre décompte des victimes. Civils, militaires, rebelles, djihadistes… la liste est sans fin. En juillet, l’Observatoire syrien des droits de l’homme (OSDH) estimait à plus de 330 000 le nombre de personnes décédées depuis le début de la guerre, en 2011. 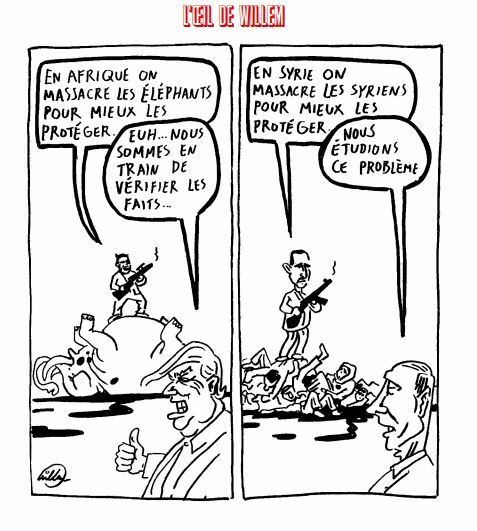 Syrie. Deux projets de résolution concurrents, américain et russe, visant à prolonger d’un an le mandat des experts internationaux enquêtant sur les attaques chimiques en Syrie ont été rejetés jeudi lors d’une réunion houleuse au Conseil de sécurité des Nations unies (photo AFP). Au moins six personnes ont été tuées et 45 blessées aujourd’hui dans des tirs de roquettes et d’obus de mortier sur plusieurs quartiers de Damas, a indiqué un média officiel. Ces tirs provenaient de la Ghouta orientale, région rebelle assiégée à l’est de la capitale syrienne, a rapporté l’agence officielle Sana, qualifiant les tirs de «violation» de l’accord de trêve en vigueur dans cette zone. 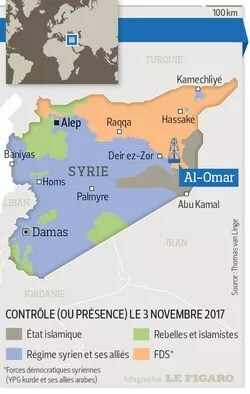 La Ghouta orientale est l’une des quatre «zones de désescalade» mises en place dans le cadre d’un accord négocié en mai entre la Russie et l’Iran (alliés du régime) et la Turquie, qui appuie les rebelles. Mais ces derniers jours, le secteur a connu une recrudescence des combats entre les forces du régime et les rebelles, avec des frappes aériennes régulières, selon l’Observatoire syrien des droits de l’Homme (OSDH). D’après cette ONG basée en Grande-Bretagne, 26 civils donc cinq enfants ont été tués dans des frappes et des bombardements au cours des dernières 48 heures. Trente-sept soldats et combattants alliés du régime ont aussi été tués dans les combats, a ajouté l’OSDH, disant ne pas avoir de bilan quant au nombre de rebelles tués. Moscou, membre permanent du Conseil de sécurité des Nations unies, a exprimé, jeudi, sa dixième opposition formelle à une résolution relative au conflit en Syrie. 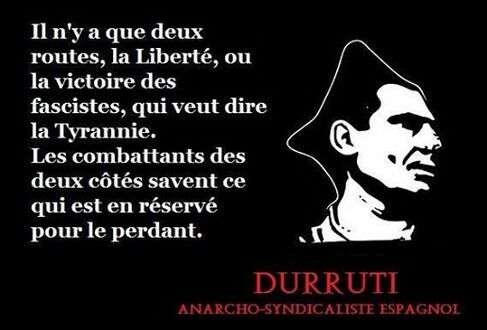 Après six ans et demi de guerre, le scénario est désormais bien rodé. Pour protéger son alliée, la Syrie, la Russie a de nouveau mis son veto, jeudi 16 novembre, à une résolution présentée par les Etats-Unis, qui visait à renouveler le mandat de la commission d’enquête sur l’utilisation d’armes chimiques en Syrie. C’est la dixième opposition formelle de Moscou, membre permanent du Conseil de sécurité, sur le dossier syrien. Ce schéma de blocage a été mis en place depuis le début du conflit, le 15 mars 2011. Depuis cette date, Moscou se contente de voter les résolutions se cantonnant à une condamnation morale des crimes perpétrés par le régime et par les groupes armés présents. Mais se garde d’approuver les initiatives internationales pouvant avoir des effets contraignants sur Damas. Fin octobre, la Russie s’était déjà opposée au renouvellement d’un an de la mission du Joint Investigative Mechanism (JIM) ou mécanisme d’enquête conjoint de l’ONU et de l’OIAC. Le travail de ces experts chargés de recueillir les preuves et d’identifier les auteurs des attaques chimiques en Syrie était pourtant l’un des rares acquis en termes de coopération internationale dans le dossier syrien. L’avenir du groupe s’est encore un peu plus obscurci avec le vote du 16 novembre. Les médecins ont donné au gouvernement syrien une liste de 452 patients qui doivent être évacués, mais neuf sont déjà morts pendant que l’ONU attend l’approbation du gouvernement syrien. Environ 400 000 Syriens vivant dans la banlieue de Ghouta à Damas ont été assiégés par les forces gouvernementales au cours des quatre dernières années. L’ONU estime que seulement 10% de l’aide humanitaire nécessaire atteint la zone qui a pris le parti des combattants de l’opposition et que les médecins ont été forcés de réutiliser des outils médicaux destinés à un seul usage. Les médecins disent que de nombreux décès évitables « à 100% » se produiront si les patients ne sont pas immédiatement évacués. Oussama Bin Javaid d’Al Jazeera rapporte de Gaziantep, près de la frontière entre la Turquie et la Syrie. 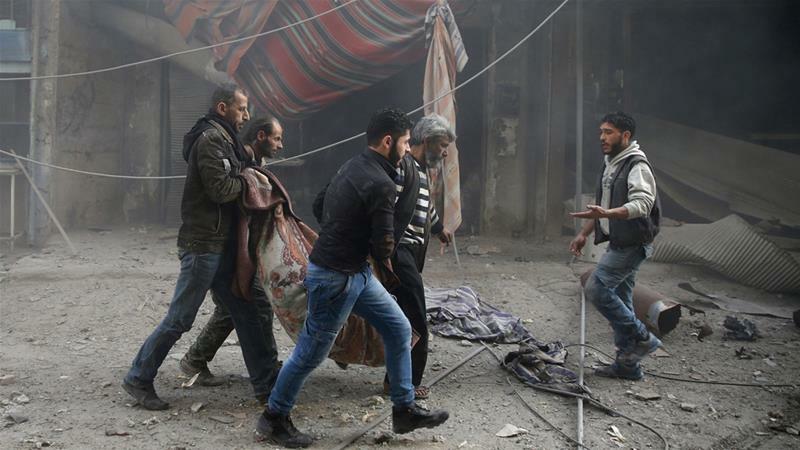 Rebel-held Eastern Ghouta near Damascus targeted with 23 people killed, while 34 die in Deir Az Zor, activists report. REPORTAGE – Washington et Moscou bataillent pour contrôler l’or noir. Les Américains ont laissé fuir les djihadistes de Raqqa qui auraient abandonné en contrepartie un site pétrolier majeur. De leur côté, les Russes déploient des mercenaires pour garder les installations pétrolières reprises à Daech. Dans l’immensité du désert, entre champs pétroliers et sites mésopotamiens dominant l’Euphrate, se joue une grande partie de l’avenir de la Syrie. Le pays, ravagé par sept ans de guerre, restera-t-il uni en un seul bloc au fur et à mesure que Damas regagne du terrain sur Daech? Ou sera-t-il, lorsque les armes se seront tues, amputé de territoires tenus aujourd’hui par les forces kurdes pro-américaines dans le nord-est du pays? Le long du fleuve qui s’écoule jusqu’à l’Irak voisin, l’armée syrienne, alliée à la Russie et à l’Iran, est en concurrence frontale avec des combattants kurdes et arabes (FDS), appuyés par les États-Unis, pour récupérer le terrain cédé par Daech. La dernière grande bataille se joue à Abu Kamal, ville frontière avec l’Irak, que des djihadistes cachés dans des tunnels ont reprise à Damas, le 11 novembre, quelques jours après l’avoir perdue. Mais ces ultimes combats dans le désert cachent un autre enjeu plus important à terme. Un triple enjeu en fait: quel sera l’avenir des Kurdes syriens qui aspirent à une certaine autonomie? Que deviendront les bases américaines qui les protègent et qui contrôlera le pétrole, arme indispensable pour financer les ambitions des uns et des autres? Dans le salon de sa maison près du quartier rebelle de Jobar à Damas, Naji Homsi déplie la carte des installations pétrolières dans cette région au centre de toutes les convoitises. Des rumeurs de coup d’État traversaient le pays après des déclarations brutales du chef d’état-major. Qu’est-ce qui vous vient à l’esprit quand vous pensez à Bagdad? Il y a un an, la capitale irakienne était une scène d’explosions, de check-points militaires et d’hommes armés qui erraient dans les rues. Bagdad a subi de nombreuses attaques et problèmes de sécurité au cours des dernières années. Je fais de nombreux reportages ici depuis 2011, et j’ai été témoin de la montée de l’ Islamic State of Iraq and the Levant (EIIL, également connu sous le nom de Daesh), qui a capturé de vastes pans du pays trois ans plus tard. Mettant de côté l’occupation et l’invasion américaines pendant un moment, les dernières années ont été incroyablement violentes pour la ville. Cependant, je remarque une différence marquée à mon retour en mission. Les checkpoints interminables de la ville sont tombés et les rues semblent plus chargées que jamais. La dernière attaque à Bagdad remonte au mois de mai de cette année, lorsqu’une énorme voiture piégée a dévasté le quartier commerçant de Karrada. Il a été immédiatement réclamé par ISIL. Je me suis rendu dans un petit café de Karrada qui avait été touché par des attentats-suicides dans le passé, pour découvrir ce que les Irakiens pensent de la situation sécuritaire actuelle. Karrar, un marchand de voitures, et ses amis s’asseoir dans la rue en fumant des chichas et se moquant généralement l’un de l’autre. Entre deux bouffées sur sa pipe à chicha, il me dit qu’il se sent confiant à Bagdad. « La ville se sent plus en sécurité, mais ce n’est pas seulement ici, nous faisons du commerce avec les gens à Mossoul, nous voyons les rues devenir plus occupées », explique-t-il alors que ses amis acquiescent. accord. « Mais il y a encore des problèmes, il y a encore beaucoup de corruption et la primauté du droit doit être plus ferme, mais nous sommes confiants que les choses changent pour le mieux ». Pour les autorités irakiennes, mettre un terme à la vague presque quotidienne d’attentats suicides était l’une des raisons pour lesquelles ils devaient vaincre l’EIIL. Le groupe armé contrôle maintenant quelques villages isolés à la frontière irakienne avec la Jordanie et est en fuite après une intense campagne menée par les forces de sécurité irakiennes, les milices Shia, les Peshmerga kurdes et les frappes aériennes de la coalition dirigée par les US. Cela a eu un effet. 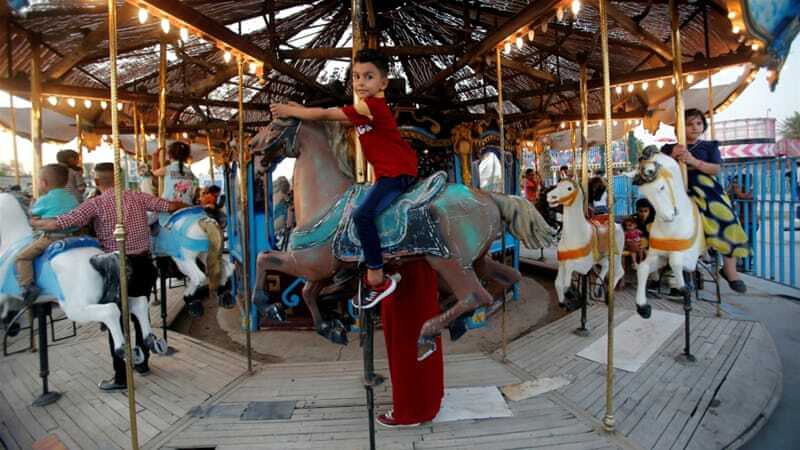 Bahar Janabi est un ingénieur à la retraite qui a amené sa famille pour un pique-nique au parc Al Zawhra. Tout autour de lui, les familles irakiennes jouent sur les balançoires et les ronds-points, et le parc d’attractions avec ses grandes roues est prêt à s’ouvrir. « Je ne suis pas allé dans ce parc depuis 15 ans, c’est notre première fois ici aujourd’hui, je me sentais toujours coincé dans mon quartier, mais maintenant je suis ici et je peux respirer l’air et voir les gens s’amuser », a-t-il déclaré. Le parc bourdonne de bruit et de rires alors que je me promène et rencontre une autre famille. Trois générations de la famille d’Ismail l’entourent. Les jeunes filles et les femmes plus âgées partagent une couverture de pique-nique. « Il y a moins d’explosions, moins de sectarisme, c’était élevé pendant les temps de l’EIIL, mais les gens ont réalisé que le sectarisme ne sert à rien et que maintenant les gens acceptent mieux les uns les autres, regardez autour de vous, nous sommes chiites, sunnites et chrétiens. dit-elle en protégeant ses yeux du soleil. Le parc est certainement rempli d’Irakiens de toutes les couleurs, mais un point de contrôle de police à l’entrée rappelle que Bagdad porte toujours les cicatrices de la violence. Pour maintenir cette paix fragile, le Premier ministre Haider al-Abadi a un véritable défi à relever. Il doit s’appuyer sur le succès de l’opération anti-EIIL et unir l’Iraq, en particulier avec la communauté sunnite qui s’est longtemps sentie privée de ses droits. Il doit aussi s’occuper des Irakiens qui ont rejoint l’EIIL. A Karrada, j’ai demandé à Karrar et à ses amis ce qu’il fallait faire pour les combattants irakiens de l’EIIL. La réponse rapide était: « exécution ». Un autre était: « justice ». Il y a encore beaucoup de colère envers ISIL ici. Gérer cela sera essentiel et traiter les causes profondes de la montée de l’EIIL encore plus important. L’une des raisons pour lesquelles l’EIIL a pu s’emparer de l’Irak était que les jeunes sunnites se sentaient ignorés par le gouvernement dirigé par les chiites, sous l’autorité du Premier ministre Nouri al-Maliki. Abadi peut-il changer cela? Il l’espère certainement, mais un attentat à la bombe dans la ville voisine d’Abou Ghraib, le 8 novembre, rappelle qu’il y a encore un long chemin à parcourir. La paix a Bagdad est précaire et est intrasectement lié a la cohésion entre sunnites et chiites dans l’Irak de d’après Daesch…. Ainsi que séparé la religion et l’Etat afin d’éviter toute instrumentalisation de cette dernière. Sa Béatitude Louis Raphaël Ier Sako, patriarche de Babylone de l’Eglise catholique chaldéenne, appelle à amender la Constitution pour garantir la citoyenneté pleine et entière de tous les Irakiens. De passage à Paris, Sa Béatitude Louis Raphaël Ier Sako interpelle dans un entretien au Monde sur les conséquences de la crise qui oppose le gouvernement de Bagdad et la région autonome du Kurdistan irakien, depuis la tenue d’un référendum d’autodétermination, le 25 septembre. Le patriarche de Babylone de l’Eglise catholique chaldéenne appelle, en outre, les autorités irakiennes à amender la Constitution pour garantir la citoyenneté pleine et entière de tous les Irakiens, sans distinction de religion. Le processus de réconciliation nationale, promis par les autorités de Bagdad, a-t-il été lancé dans le pays ? Non, et aujourd’hui la situation est pire encore à l’approche des élections (législatives et provinciales) de mai 2018. Les partis politiques et les coalitions préparent le terrain et sont en compétition. Ils instrumentalisent la religion. Il est très important de se pardonner et de s’ouvrir au présent et à l’avenir. Il faut laisser de côté la mentalité de vengeance et de violence. Il faut préparer l’avenir avec une mentalité d’ouverture à l’autre et aux droits de l’homme. Il faut que tous les Irakiens s’y mettent. On commence à voir une prise de conscience au sein de la population, avec des manifestations chaque vendredi à Bagdad, pour les droits de l’homme, les droits des femmes, le changement de culture… Le nombre de manifestants augmente de semaine en semaine.